Design #082CS, City Glow Holiday Card, is one of my personal favorites. I love it so much I selected it as my personalized Christmas cards to send to family and friends. I am partial to city scenes and while the scene itself could certainly be in a small town, you do get the sense of a city park during the holiday season with the tree all decked out in lights standing out beautifully against the newly fallen snow. Many people equate big cities with big buildings and pollution. Perhaps they forget that you can find beauty there as well or just haven’t been to the big city during the holiday season. 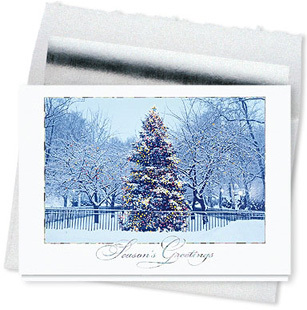 While I certainly appreciate the quaintness of the small towns and the simplicity of the suburbs, this city girl is glad to send a little bit of the big city to all on her holiday cards list with these beautifully personalized holiday cards.